Q3 2011 Finance Industry Trends - Berkery, Noyes & Co., LLC. 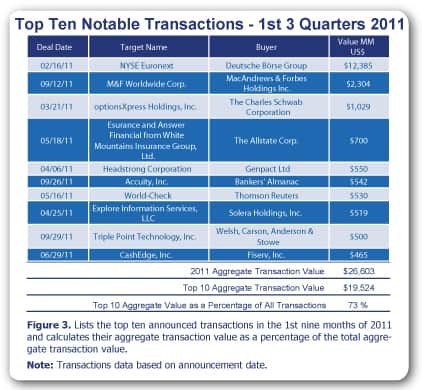 The most active acquirers in Q3 2011 were Welsh, Carson, Anderson & Stowe, Accenture, GTCR, LLC, SunGuard Data Systems Inc., TPG Capital, and Emblaze Ltd., with 2 acquisitions each. MacAndrews & Forbes Holdings Inc.’s announced merger with M&F Worldwide Corp. was the largest transaction for Q3 2011, with an acquisition price of $2.3 billion. There were 32 financially sponsored transactions through Q3 2011 with an aggregate value of $3.44 billion, representing 17 percent of the total volume and 26 percent of the total value, respectively. Total transaction volume in Q3 2011 increased by 31 percent from Q2 2011, from 55 to 72 transactions. 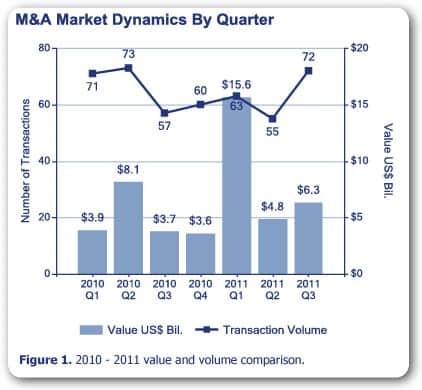 Total transaction value in Q3 2011 increased by 31 percent from Q2 2011, from $4.8 billion to $6.3 billion. 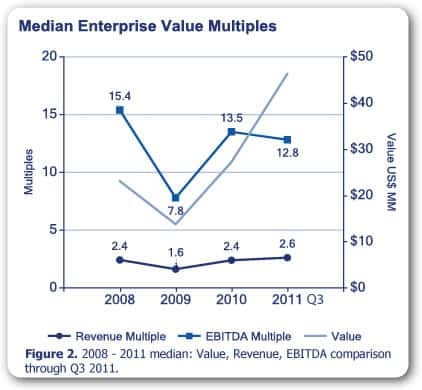 Median EBITDA multiples from 2010 to the first nine months of 2011 went from 13.5 to 12.8, a 5 percent decrease, while median revenue multiples rose from 2.4 to 2.6, an 8 percent increase. Median value saw a significant increase, in line with the overall increase in transaction value during this time period. The top ten deals by value have increased, with three acquisitions entering the list from Q3 2011: MacAndrews & Forbes Holdings Inc.’s acquisition of M&F Worldwide Corp., Bankers’ Almanac’s acquisition of Accuity, Inc., and Welsh, Carson, Anderson & Stowe’s acquisition of Triple Point Technology, Inc. These three acquisitions, with an aggregate value of $3.3 billion, represent 12 percent of transaction value in the 1st 3 Quarters of 2011, and 52 percent of Q3 2011 transaction value.